Chosen as one of Forbes America's Most Promising Companies, the Packsize story is one manufacturing companies need to watch. 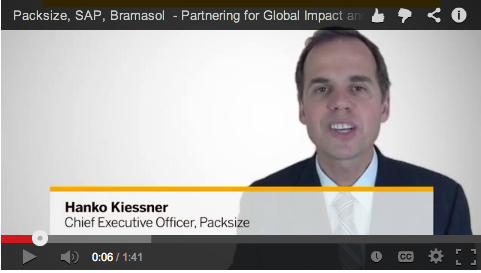 Learn how Packsize partnered with SAP and Bramasol to establish a solid foundation to support a yearly growth rate of 40%. After implementation of the SAP Business-All-In-One solution, Packsize has achieved global visibility into manufacturing demand and status, procurement needs and sales activity. With that result Packsize continues to attract marquee companies across the globe and recently just established a relationship with Staples as their sole supplier for On Demand Packaging®. SAP is running a series of webinars focused on the Professional Services market in conjunction with Service Performance Insight (SPI), a global research, consulting, and training organization dedicated to helping professional service organizations (PSOs) make quantum improvements in productivity and profit. It's no surprise that the SAP Insider Manufacturing webinar about Packsize was well attended; their story is one worth hearing about. Founded in 2002, this company has had tremendous success, holding operations in twenty-six countries and serving clients like Staples.com, Emerson, Acuity, Mack Molding, Mity-Lite Inc., and Graphic Tech. Blog Spotlight: "CFOs Don't Know about Upcoming Revenue Recognition Standards"